Heat a large frying pan with a few drizzles of olive oil. Add the garlic and the frozen creamed spinach. Sauté until the spinach is thawed and the garlic is a beautiful golden. Add the drained chick peas and the chicken broth and continue to simmer on low. Add the drained tuna and toss. Remove from the heat and set aside. Prepare the spaghetti as directed. 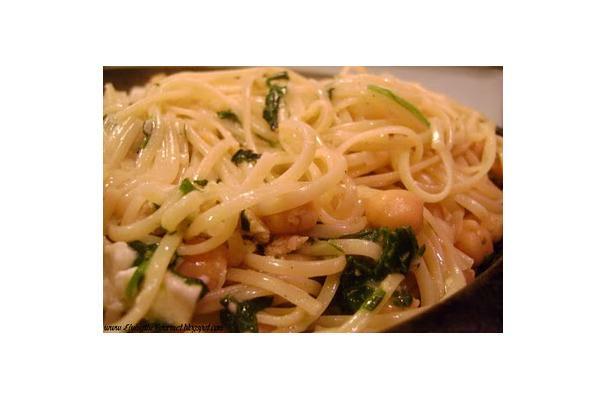 Lift the spaghetti out of the water and place it in the spinach and chick peas. Add the crumbled feta cheese and toss. Drizzle a little olive oil over the top and add a few dashes of red pepper flakes. This dish is very delicious! It is easy and has a gourmet taste!